We, as a Bolton based company, are proud to offer our customers exceptional transportation services. The unparalleled services we offer have not gone unnoticed by our customers, which is why they come back time and again to benefit from what we have to offer. We are always searching for ways to improve our service and receive our customers’ suggestions positively. Our services are flexible on nature and we can mould and customize them according to our customers’ requirements. No matter what sort of trip you are planning for, we will corporate with you in every situation to guarantee that you get exactly the kind of experience you were looking for. We are an experienced group of people, working together towards achieving the same goal. Your job is just to provide us with the appropriate details and we will be there waiting to serve you. Our fleet is made up of a wide array of vehicles. 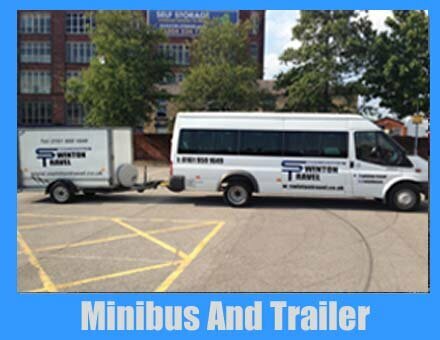 and, we also present to you our minibuses and trailers. Our minibus and trailers are quite popular amongst our customers and areone of our most rented vehicle combinations too. If is a school trip your planning then our minibus will serve you just right. Students of an entire classroom could easily fit into it without overlapping each other. That’s not just it. Our trailers are of equal importance too. We have high quality trailers that can transport heavy luggage, bicycles and even golf clubs safely, from one spot to another. If you are carrying excess luggage with you, you can attain the services of our trailers to carry it around. It doesn’t matter if the service is for day trips, airport transfers, moving from one home to the other, our trailers work fine in every case scenario. Hence, you don’t have to be uncomfortable in your vehicles just because you are carrying with you some extra luggage. You can always avail our facility of trailers to transport your luggage from one place to another. You can contact us to make your bookings by calling us or sending in an email. Our staff is always there to attend to your needs and questions. You can also drop by our Bolton office for a face to face meeting with our stff.